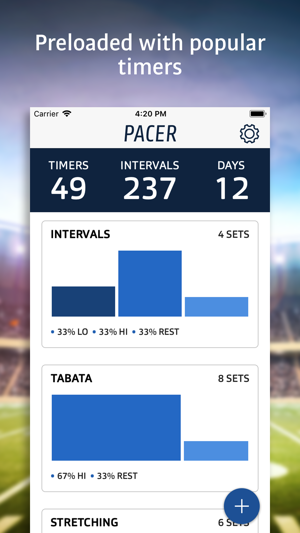 Pacer is the best interval timer because it was created by a Nation Academy of Medicine certified personal trainer. 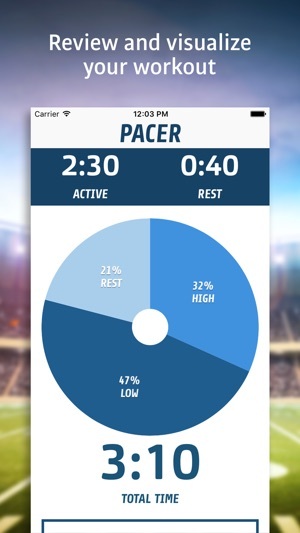 WHY USE A FITNESS TIMER? By timing your workouts, you ensure you get more results in less time. Just a few minutes of interval workouts a day can increase fat burning and endurance capacity. Research shows you can achieve more progress in 15 minutes of interval training than running for an hour. 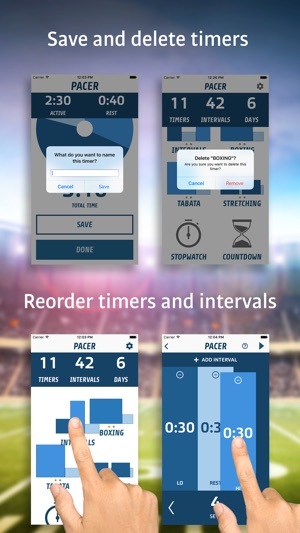 The home screen is pre-loaded with different timers and popular interval workouts. • Intervals. 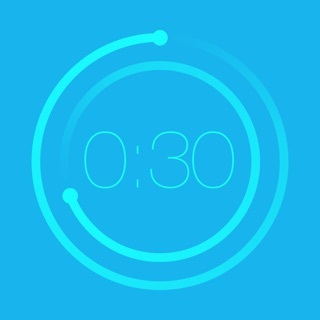 This is a generic interval setting of 30 seconds at low intensity, followed by 30 seconds at high intensity completed by a 30 second rest. You can repeat it as many times as you want or tweak the intervals to suit your needs. • Tabata. A Tabata is a specific interval workout of 20 seconds of work followed by 10 seconds of rest, repeated 8 times. What exercises can you do in a Tabata? Well, pretty much anything, but we recommend you pick something easy. You'll be doing it a lot for about 4 minutes. • Countdown. A countdown is the simplest a timer can be. It's one interval of any duration. It’s perfect for a single time-based exercise like a warmup or cooldown. • Stopwatch. Not all exercises should be time based. Some should be work or rep-based. For those you can use a stopwatch timer. • Use whatever music app you're using already. In Settings you can configure audio cues and volume. • Use bluetooth headphones and set the device in landscape. Stopwatch intervals. 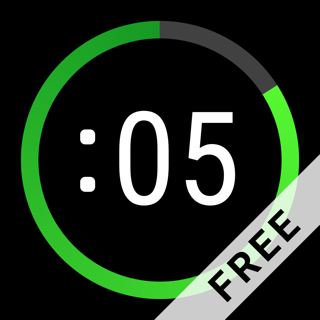 Now you can have a stopwatch inside an interval timer! 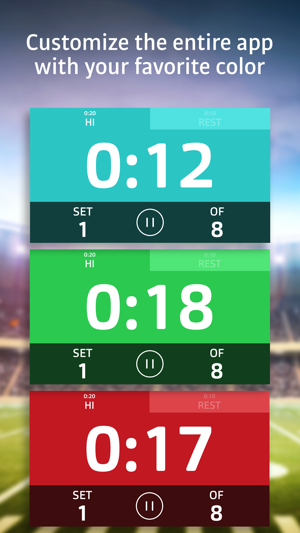 Simply scroll the interval time all the way down to 0 and you'll see a stopwatch icon. This interval will count upwards and ends when you press the stop button. Then the next interval will start automatically. 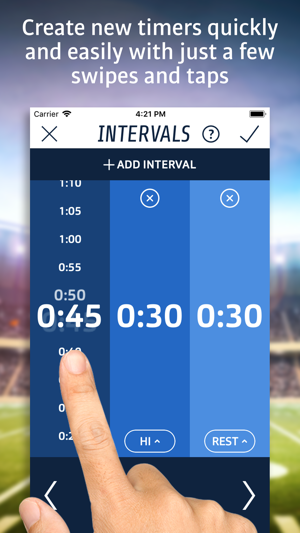 - Use a stopwatch interval for repetition-based, workload based or distance based exercises. 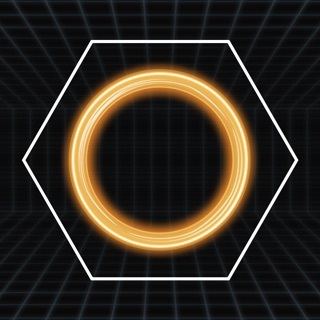 The app will no longer run in the background or when the screen is locked. The counter still counts but the noises stop so I don’t know when my interval is up. Since I can’t hear the noises with the screen locked I have to workout with the screen unlocked. This causes my phone to constantly switch to viewing ads in safari if the screen accidentally gets tapped. Used to love this app now it’s basically useless as it doesn’t work properly if the screen is locked or if another app is open. I used to watch Netflix while doing elliptical intervals and that is no longer possible since the app doesn’t work if another app is open. 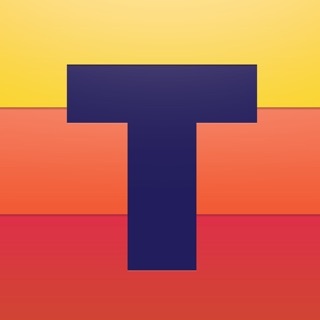 Great timer app! Love the flexibility and the new UI and customizations. One future update request: add the ability to adjust the Countdown Time length. It would be great to have the capability to set a countdown time longer than 3 seconds, or have the ability to add a unique countdown time per custom timer. Great suggestion. We will try to find a way to incorporate this into a future release.